Apart from the hideous in separating kids from the families and even flying them in distant places to literally imprison them, apart from the repulsive fact that some of these kids are barely able to communicate beyond their mothers and close family members or ever lived away from them, there is one element that elevates Dorland Trump, his family, his cronies, his supporters and definitely his administration to the levels of cannibals. The fact that they profiteer from these separations is beyond inhuman and explains why this administration runs away from every global body defense human rights. They are all criminals in violation of basic human rights and soon will cost lives of infants and definitely have scared and destroyed lives of children. These kids, these three and six year-old-kids and of course their parents are left to private jailers and prisons, thriving corruption and inhuman attitude to repeatedly fail humanity where Trump’s administration has failed. A president and an administration that cuddles with Vladimir Putin, Kim Jong-un and a serial killer like Rodrigo Duterte; cannibalism is just one more step. One more step to where? And how are we going to act and react to an inhuman state? Are we going to repeat Chamberlain’s mistake in front of Hitler? Waving peace treaties while the devil was building consecration camps and crematoriums? And how are we going to help the American people to wake up from this nightmare they live and it drives them to an absolute division? 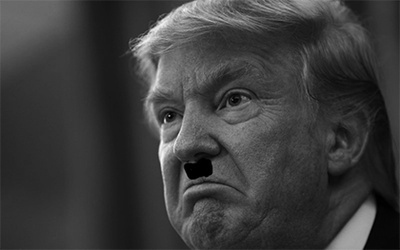 A small authoritarian, racist and human-haters minority is leading USA to a civil war with too many sides. A society divided to too many pieces all of them fueled by hate. A hate one man and his gang of criminals infuse and are responsible. The fact that this administration and Trump personally are profiting from the separation of the kids should not surprise anybody, the fact that nobody dares to stop him should shock us. That actually shows how sick the American society is and how ideals are lost or even worst …never exhibited.